Food safety is still a major concern at public canteens in Hanoi, especially at factory cafeterias in industrial zones, according to officials. Tran Van Chung, deputy director of the Hanoi Department of Health, said several food poisoning cases have occurred at public canteens in the city in recent months. He blamed substandard food at canteens and low awareness of their staff. In the latest incident, 29 trainees from Song Hong Human Resources JSC suffered food poisoning after having dinner provided by New Sky Food Processing and Trading Ltd. They were rushed to local hospitals for emergency treatment after experiencing stomach aches, headaches, vomiting and high fevers. The incident has prompted competent agencies to tighten the management of public canteens at industrial zones and schools in the capital. According to the health department, there are 4,256 public canteens in the city, including 457 in industrial zones. 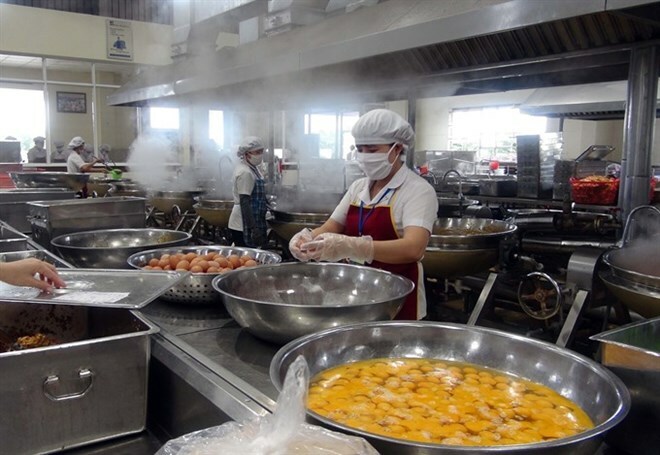 Hoang Thi Minh Thu, deputy head of the Hanoi Food Safety and Hygiene Division, said inspectors from the Hanoi Department of Health and Hanoi Food Safety and Hygiene Division have inspected 133 public canteens, including 96 in industrial zones. Fourteen canteens were found to have violated food safety and hygiene and safety standards, with total punishment amounting to 85.5 million VND (3,700 USD). Common violations included failing to store food samples properly, using substandard facilities and a lack of regular health examinations for kitchen staff. Nguyen Thanh Phong, director of the Ministry of Health’s Administration of Food Safety and Hygiene said food poisoning at public canteens is a major problem. According to him, ready-to-eat food was the biggest issue leading to food poisoning. Surveys conducted by the administration showed that about 70 percent of food poisoning cases came from catering services, he said. Inspections revealed that only 20 percent of companies at industrial and processing zones set up their own public canteens, while the rest signed contracts with food processing and trading companies. Ngo Dinh Loat, deputy head of the Hanoi Agro-Forestry Fisheries Quality Assurance Division, said with a population of more than 10 million, the demand for food in the city was big. Hanoi could produce only 60 percent of the food and the rest comes from neighbouring provinces. Ha Linh Chi, a representative from Panasonic Appliances Vietnam Ltd Company, said the biggest challenge in ensuring food safety in canteens was the honesty of food suppliers. Most public canteens could show certificates declaring the origin of food and sample tests were used, but it was impossible to ensure they met standards stated in signed contracts or not, she said. Vo Viet Dung, chairman of Nam Hanoi Food Processing JSC, agreed, citing the fact that some small enterprises affiliated with big firms who specialise in producing safe food. However, they still purchased food with unclear origin to supply public canteens. Dung also said the low cost of a meal for workers at industrial zones posed difficulties for companies in ensuring nutrition and quality. Tran Kieu Huong, a representative from Ba Sao Food Service Ltd company, agreed. “A meal for workers must meet certain quantity and quality of food while the company pays only 18,000 VND per dish,” she told the Ha Noi Moi (New Hanoi) newspaper. In addition, she said, companies who provided safe food couldn’t meet the requests of every canteen as they were scattered in different places. To tackle these problems, city authorities had signed contracts with 21 provinces and cities in the north to provide safe food, Loat from Hanoi Agro-Forestry Fisheries Quality Assurance Division said. Quick response (QR) code applications had been deployed to trace the origin of agricultural products to control quality. This enabled companies to choose the right products, he said. Regarding communications activities, Huong stressed the need to improve the awareness of those involved. It was necessary to educate managers, chefs and staff working at canteens and food processing companies about their responsibility in ensuring safe food, she said. To ensure food safety at public canteens, Tran Van Chung, deputy director of the Hanoi Department of Health, said the origin of the food would be tightened and inspections on public canteens would be strengthened. Any violations should be strictly dealt with.